The fifth millennium is characterized by far-flung contacts and a veritable flood of innovations. While its beginning is still strongly reminiscent of a broadly Linearbandkeramik way of life, at its end we find new, inter-regionally valid forms of symbolism, representation and ritual behaviour, changes in the settlement system, in architecture and in routine life. Yet, these inter-regional tendencies are paired with a profusion of increasingly small-scale archaeological cultures, many of them defined through pottery only. This tension between large-scale interaction and more local developments remains ill understood, largely because inter-regional comparisons are lacking. 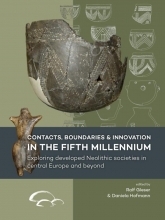 Contributors in this volume provide up-to-date regional overviews of the main developments in the fifth millennium and discuss, amongst others, in how far ceramically-defined `cultures` can be seen as spatially coherent social groups with their own way of life and worldview, and how processes of innovation can be understood. Case studies range from the Neolithisation of the Netherlands, hunter-gatherer - farmer fusions in the Polish Lowlands, to the Italian Neolithic. Amongst others, they cover the circulation of stone disc-rings in western Europe, the formation of post-LBK societies in central Europe and the reliability of pottery as an indicator for social transformations. Early Middle Neolithic pottery decoration - different cultural groups or just one supraregional style of its time? Schiepzig enclosures: gaps in the archaeological record at the end of the fifth millennium BC in northern central Germany?